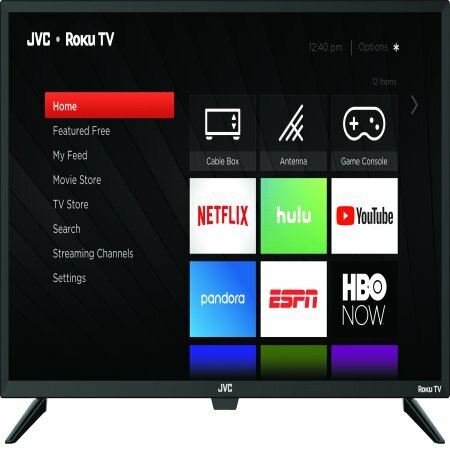 The HD resolution JVC 32&quot; Class HD (720p) Roku Smart TV (LT-32MAW388) is more than a smart TV - it's a better TV. All of your entertainment is in one place with access to over 500,000 movies, TV episodes, and more than 5,000 streaming channels. Start streaming your favorite shows, access your cable box or HD antenna, even fire up your gaming console - all from your home screen. With Featured Free on your home screen, you're one click away from hundreds of free movies, TV episodes, and live news from channels like The Roku Channel, ABC, CW and more. Easily search across top channels for results ranked by price. Use the free Roku mobile app for iOS or Android devices to search by voice, cast personal media or video, and control your TV. I like how lightweight it is and easy it is to set up. I'm a college student and this was in my pricing range for what I wanted it for. If it doesn't have an app that I usually use, I was able to download it and get it on my TV. Overall, I'm very satisfied with my purchase. Would recommend for anyone who isn't really into all the tech stuff but wants a smart tv for the general app usage. Best TV I ever purchased!! I never owned a Smart TV before and I think this is great!!! Best TV I have ever owned and the volume is great!! I own a regular flat screen TV and the volume is not that great. I had to buy a speaker to have greater sound but this TV only has to be on level 26 and it has lots of sound. This was definitely a good buy for the money. we bought 2 of these tv's for the bedrooms when the grandkids come they love the streaming on utube and their game play and i love the sound is not to loud to run me out of my house. lol. also i love the ease of use of these tv's and they have lasted over a year now we strongly recommend. we have had no issues with ours. I needed a 32" HDTV for a bedroom. This is a great little TV at an amazing price, around $128 plus tax, plus free 2-day shipping, and it was delivered on time. I was unfamiliar with a Roku TV, but after reading other reviews decided to try it. It is great, very easy to set up, had apps I wanted (Netflix, Amazon Prime) and it was easy to add other apps I want (like MLBtv). Plus the Roku channel offers free movies and tv shows. Picture is great, the tv works great. Sound quality is just so-so as is the the norm for most flat screen TVs, so no problem with that. I am extremely pleased with the tv. If you're in the market for a 32" flat screen TV, you can't beat this for the price. For the price it's a great tv. The fact that it has Roku already installed is really convenient and the main reason for purchasing. Only issue is the sound doesn't sound quite right and I haven't figured out if it can be changed or not. Extremely lightweight, so you might want to mount this tv on a wall. The remote did not work initially. A new one was sent out and it didn't work on the first attempt. Left it alone for a few hours and on just a hunch, thought I would give it one more try. It did work and we were able to update all the streaming services since we do not have an outlet in the room. I got this TV brand new had it one day and has a green dot that looks like it will eventually be Aline going across my screen ,the volume is very low and I have Bose speakers connected both turned all the way up and still can't here. I put my other TV on 10 and it's too loud. I don't reccomend this TV. Hoping to get a refund. This tv didn't work right out the box. The Roku remote would not work with the tv. Support is 9-5 weekdays (really??) I know how to program smart tvs; I own three not including the new one. I took it back and went with a familiar brand that was, by the way, $5 cheaper (and worked). Returned it because the roku remote didn't work (and I know how to use them because I have 4 Rokus). However, it could have been a bad infrared receiver on the TV. But the TV just seemed junky. I was very disappointed (to put it nicely) that I had to waste my time going to get it and then returning it. I went to Best Buy and paid $10 more and bought a different brand that works great.